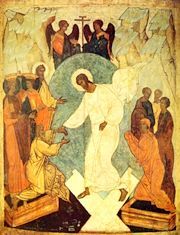 In Orthodox Christianity, Resurrection can refer to the Resurrection of Our Lord and Savior Jesus Christ or the Resurrection of the dead at the Final Judgment. The Gospels narrate that after Christ's Passion and suffering on the Cross, he was laid in a tomb which was donated by Joseph of Arimathea. After three days in the tomb, Christ had descended into Hades and broke the bonds of Death through his resurrection. The belief of Christ's Holy Resurrection is reiterated in the Nicene-Constantinopolitan Creed. This Resurrection, commemorated every year on Great and Holy Pascha and every week on the Lord's Day, is the most fundamental belief of the Church. It confirms the authenticity of Christ's teachings, His Godhood and Manhood, and proves the veracity of His work in redeeming mankind from the Fall. Conquering sin and its result, death, Christ is often referred to as the "New Adam," bestowing new life to humanity. As the Apostle Paul states, "For as by a man came death, by a man came also the resurrection of the dead. For as in Adam all die, so also in Christ shall all be made alive." The Resurrection of Christ is foretold in several Books of the Old Testament, as in The Book of Hosea, where the prophet says, "After two days He shall revive us: in the third day He will raise us up, and we shall live in His sight." Before the ressurection, all the dead would go to Sheol (Hades) wether they were righteous or not. It was a place of darkeness and death.. After Christ was laid into the tomb, he descended into Hades and broke the bonds of death and let out all of the people therein, such as King David and Solomon, John the Baptist, Adam and Eve among others. During Jesus' time, there was much debate amongst the Jews over the Resurrection of the dead. One such faction, the Pharisees, preached the resurrection, while the Sadducees, rejecting it, believed in no afterlife whatsoever. The Church teaches that Christ's Resurrection guarantees our salvation and that together with His Ascension it brings to fruition God's union with us for all eternity. While the Resurrection has not yet abolished the reality of death, it has revealed its powerlessness over us in Christ. Since mankind shares in Christ's Resurrection, the Church teaches that all mankind shall rise from the dead at the Final Judgment. Therefore, Christ is the "first fruits of those fallen asleep." In the Acts of the Apostles, St. Paul confirms this by saying, "...he hath appointed a day, in the which he will judge the world..." and "...there shall be a resurrection of the dead, both of the just and unjust..." While the Church does not go into much detail as to the exact events of the Last Day, it is believed that those who love the Lord and follow His commandments will find paradise in His presence, while those who hate him will find infinite torture. In iconography, according to the Byzantine iconographic type, the Resurrection — as early as the eighth century — is portrayed primarily by the Descent of the Saviour into Hades. Our Lord is depicted pulling up Adam and Eve out of their sepulchers while trampling upon the gates of Hades (death). In the background stand the Old Testament patriarchs, prophets, and other figures, including John the Forerunner, who announced Jesus' advent. "Christ is risen from the dead, trampling down death by death, and upon those in the tombs bestowing life." Anastasis, Nea Moni of Chios, Greece, 11th c.
Anastasis, Hosios Loukas Monastery, Greece, 11th c.
Anastasis, St. Mark's Cathedral, Venice, 12th c.
The Anastasis fresco in the parekklesion of the Chora Church, Istanbul, 14th c.
Theophanes the Cretan, 16th c.
The earliest crucifixion in an illuminated manuscript, also shows the resurrection. Miniature from Ingeborg Psalter, 13th c.
Myrrh-Bearing Women at the Tomb of Christ. ↑ Constantine D. Kalokyris. The Essence of Orthodox Iconography. Transl. Peter A. Chamberas. Brookline, MA: Holy Cross School of Theology, 1971. pp. 33. ↑ St. John of Damascus. “Demonstrative Discourse Concerning the Holy and Precious Icons.” §3, Patrologia Græca, Vol. XCV, cols. 313D-316A. ↑ Metropolitan Hierotheos of Naupaktos. Οἱ Δεσποτικὲς Ἑορτές [The feasts of the Lord]. Lebadeia, Greece: Hiera Mone Genethliou tes Theotokou [Pelagias], 1995. pp.262,263. ↑ Kalokyris. The Essence of Orthodox Iconography. pp.33,35. ↑ Kalokyris. The Essence of Orthodox Iconography. p.36. ↑ Michel Quenot. Ἡ Ἀνάσταση καὶ ἡ Εἰκόνα [The Resurrection and the Icon]. Katerine: Ekdoseis “Tertios,” 1998. p.94. ↑ Branos. Θεωρία Ἁγιογραφίας. pp.216,217. ↑ Paul Evdokimov. The Art of the Icon: A Theology of Beauty. Transl. Fr. Steven Bigham. Redondo Beach, CA: Oakwood Publications, 1990. p.325. ↑ Branos. Θεωρία Ἁγιογραφίας. pp.225. ↑ Protopresbyter Georges Florovsky. “Ὁ Σταυρικὸς Θάνατος” [Of the death on the Cross]. In: Ἀνατομία Προβλημάτων τῆς Πίστεως [An analysis of matters of faith]. Transl. Archim. Meletios Kalamaras. Thessalonica: Ekdoseis Bas. Regopoulou, 1977. pp.79-81. ↑ Leonid Ouspensky, in Leonid Ouspensky and Vladimir Lossky. The Meaning of Icons. Transl. G.E.H. Palmer and E. Kadloubovsky. Crestwood, NY: St. Vladimir’s Seminary Press, 1982. pp.187,185. Chancery of the Holy Synod in Resistance. REPORT: The Holy Icon of the Resurrection, Basic Principles for Overcoming an Unfruitful Dispute. St. John the Theologian, September 26, 2007 (Old Style). This page was last edited on August 21, 2013, at 18:08. This page has been accessed 74,239 times.